Spring is in the air, so we're having an outside book and a snack activity! (Or inside if you're brave:)). All my kids from the baby on up LOVE the Touch the Art books by Julie Appel and Amy Guglielmo. They are board books that feature famous works of art with some element that you can touch or feel. For the older kids, there is a section in the back that has details about each artist and work of art. It's a great family activity for all ages. Babies will have a hard time destroying these books and the older kids can get some learnin'! For an afternoon of fun, whip up these easy edible finger paints, give each a child a piece of posterboard, and let them, eat, paint, squish, smoosh, and release that inner Picasso. Great fun for all ages. We are going to do this for a family activity the next nice day we have. I can't wait to see what the baby comes up with. Milk (according to package directions). You can substitute Soy or Rice Milk for those with allergies. Prepare pudding according to package directions. Divide into bowls and tint with food coloring. Paint away! My neighbor gave me this recipe awhile ago and was going crazy about how fabulous it was. I though, "crescent rolls? Cream cheese? Cinnamon? Sounds good, but can't be anything to go crazy over." I have tried these and am in LOVE! Crazy, cinnamony, LOVE!!! I love that they're easy (you and the kids can prepare them in 5 minutes flat) and that they taste like yummy cinnamon rolls with cream cheese frosting. Note: for some reason, they are the most fabulous cold. So, let them cool for awhile, pop them in the fridge until completely cold, cut into squares, and try not to eat the whole pan by yourself. Spread 1 crescent roll package on bottom of greased 9 x 13 cake pan. Mix together 2 packages cream cheese, ¾ c. sugar, and 1 tsp. vanilla and spread on top of crescent roll. Spread 2nd crescent roll package on top of mixture. Mix ¼ c. sugar and 1 tsp. cinnamon and sprinkle on top of 2nd crescent roll. Bake at 350 for 20 minutes. Cool for awhile, then pop into the fridge until completely cold. Cut into squares and enjoy! Notes: Next time, I am thinking about mixing some homemade apple pie filling in with the cream cheese. I'll post a review! My wonderful friend Camie gave me this great recipe last year and it's been a hit ever since! My kids are crazy about this soup. I like to make up a huge batch and freeze it for quick meals later. Our favorite way to serve it up is with my friend Ruth's no-fail "Pizza Hut style" breadsticks (recipe below the soup). Sauté beef and onion until browned. Add carrots, celery and tomatoes; simmer 10 minutes. Add beans and remaining ingredients. Simmer 10 or more minutes. Remove from heat and cool. Pour into Gallon Freezer Ziploc bags and freeze. (I like to double bag it). 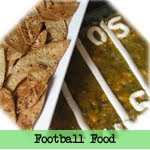 When ready to eat, place in fridge overnight and heat on the stove or microwave. Dissolve sugar, salt and dry milk in hot water. Add enough flour (~1 cup) to make a soupy mixture. When the mixture is no longer hot but still warm add the yeast and stir well. Then add the rest of the flour, enough to form a moderately stiff dough. Knead the dough until smooth. Roll dough into a rectangular shape the size of your baking pan. Spread half of the butter onto the baking pan, then place your dough into the pan and spread the remaining butter on top of the dough. Top the breadsticks with garlic salt, parmesan cheese, salad seasoning salt, or whatever you want. Cut the dough into breadsticks with a pizza cutter and let raise for 10-15 min. Bake at 350 degrees for 20- 25 min. Yum! Works for Me Wednesday! Check out Rocks in My Dryer for all kinds of fabulous tips. 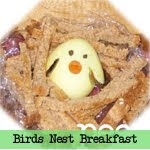 I saw a cute recipe for birds in a nest using Twinkies, toasted coconut, and other yummy things. You can get it here. Unfortunately, I didn't have enough of any of the ingredients and it also looked time consuming to make the coconut nests. So, we made up our own version using things we had in the pantry. 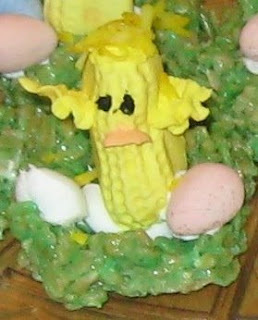 Green-tinted rice krispy treats make up the "nest" with a yellow circus peanut making up the bird. (Twinkies, milano cookies, or anything elongated and yellowish would work, too!). Tweet, Tweet! Have fun! Melt butter and marshmallows in microwave for 2 minutes. Stir, cook for 1 additional minute. Stir in a few drops green food coloring and mix in rice krispy cereal. Mold into little "nest" shapes. Make up royal icing (recipes to make it using either meringue powder or egg whites are here). Tint entire batch yellow. Scoop out at least 1/2 c. into a bowl and tint with red to make orange. Keep bowl covered with damp cloth to prevent hardening. Pipe on little wings and a beak. (I used a leaf-shaped decorating tip). On the Family Fun instructions, they used yellow citrus gumdrops for the wings. This would work great, we just didn't have any. :) Put two black dots or mini-chocolate chips for eyes and let everything set. After frosting is dry, put a small amount of frosting in nest and attach "bird". Add chocolate eggs or jellybeans to garnish. Finally, place small amount of coconut in baggie and add a few drops yellow food coloring. Mash around to mix and tint the coconut. Place a small amount of frosting on top of the chicks head and add a pinch of coconut "feathers". Step back and watch these little "tweets" take flight! So, I had some extra royal icing left over from the Birds in a Nest. I hated to see it go to waste, so here's what my mom taught me to do. Put a star (or whatever kind you want) decorating tip on your frosting bag and pipe out a bunch of flowers on wax paper. After they are dry, you can put them in a ziploc baggie or tupperware and they will store for several months at room temperature. These are GREAT for quick cake, cookie, or cupcake decorations. I have several colors in my pantry from "leftover" frosting. We're busy today but we needed a quick GREEN snack. I rummaged through the cupboards, and voila!, Leprechaun Pudding was born. Place 2 heaping Tbs. of pudding mix and 1/2 c. milk in a ziploc baggie. Add a few drops of green food coloring. Let the kids squish, squash, mash, and mix for about two minutes. Spoon into cups and garnish with whipped cream (or just eat out of the bag for a really easy snack). Here's the latest letter snack. I wish I had found this a couple weeks ago when we were on the letter "T". I especially like the pretzel stick "campfire" next to them. Looks cute and fun. 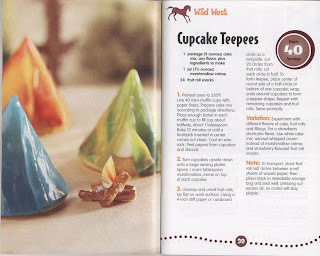 We're in the middle of getting ready for an Easter party, but I will try to make these next week and post a review! *Every time we've made it it's gotten rave reviews. *You can decorate this cake in about 5-10 minutes. *It's pretty hard to mess up. My kids have done some wild candy on them but it seems to just add to the cuteness. 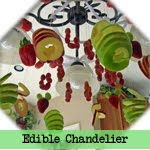 *For a big party, you could make several for a fabulous tablescape that doubles as dessert. So, grab some candies that you've hidden in the cupboard and have fun! There are so many great combos...I'm thinking of making a creme de menthe cake with chocolate frosting and York Patties decorating it. Yum! Make two loops with Fruit by the Foot for a "bow" and add two tails. Decorate with your favorite candy. We've used M & M's, suckers, gumdrops, Smarties, Skittles, just about everything. My girls LOVE this book and I'm featuring it at our preschool this week. I already made some strawberry-shaped sugar cookies but thought they would have lots of fun with this sparkly treat courtesy of Family Fun. You could also use Sparkly Strawberries for a fun "S" snack. Step 1 Wash the whole berries and pat them dry with a paper towel. Fill a shallow bowl with colored sugar (you can buy this at the grocery store or mix your own by stirring two drops of food coloring into 1/4 cup of sugar). Step 2 In a mixing bowl, blend the cream cheese, confectioners sugar, milk, and vanilla extract with a fork until smooth and creamy. Add more milk if needed to achieve the desired consistency. Step 3 Holding the berries by their stems, your kids can dip them into the cream cheese mixture, roll them in the sugar, and enjoy. 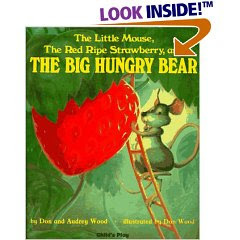 I am teaching this book at preschool this week, so I though I'd share my lesson plan if you'd like to use it sometime. Talk about what the mouse did. How do you feel when you share? Strawberry Hunt—take pink plastic easter eggs and decorate to look like strawberries (use a sharpie to make seeds and either color green on the top or glue on a piece of green felt). Fill with a couple jellybeans and let the kids hunt for them. Explain that we are going to share them just like the little mouse. Then, put them all in ONE basket and share evenly with everyone at snack time. Print out “Sharing makes me Berry Happy” coloring page (you can download the one I made here). 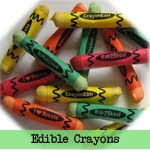 After they are done coloring it, punch a hole at the top, tie to a ribbon & make into a necklace to take home. Here are a few more St. Patricks Day drinks for those of you who don't want to go the spinach route :) (see the Shrek Drink here). Thanks to http://www.amazingmoms.com/ for the ideas! Put one, or two small scoops of lime sherbet in a clear glass ice cream cup, or beer mug. Pour 7-Up over the sherbet. Add a dollop of whipped cream, green sugar sprinkles and a green maraschino cherry! Drop two scoops of mint chocolate chip ice cream into a glass beer mug. Pour milk over the top add a drop or two of green food coloring. Top with whipped cream and green sugar sprinkles. Blender Directions: Place candy pieces and place into the freezer for 15 minutes. Combine all ingredients in the blender and blend on medium speed for 30 seconds. Stir with a spoon and blend for 30 more seconds. Repeat until desired consistency is reached. For a thicker shake, place blended milkshake into freezer for a few minutes.Top with whipped cream and more mint candy pieces on top. Is is Spring yet? I found these quick cupcakes and they were a hit. (I think they were from Family Fun, I don't know...it was clipped out in my files:)). *Start with your favorite cupcake, baked according to box directions. 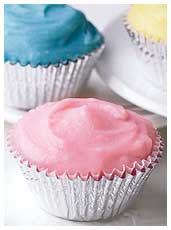 *Frost with any color icing, your choice! *For the flowers, simply cut marshmallows in thirds (let the older kids do it, they think it's super-cool), put a gumdrop in the center, and let everyone arrange the marshmallow "petals". Notes: You can buy strawberry marshmallows for pink petals if you have a girly crowd. 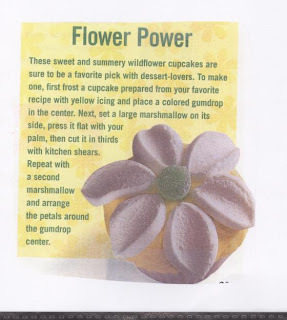 Or, after you cut it, you can dip the sticky side of the marshmallow in colored sugar for a sparkly flower! We did a couple colors of background icing to make a colorful garden. Click image to enlarge and happy cooking! Sorry I haven't posted for a few days, we've been on vacation! I just found these random snack ideas in my recipe files. I have no idea where they originally came from, but we make "cheese hammers" quite often. We'll be posting more recipes this week! Put small amounts of trail mix, cereal, pretzels, etc. in plastic sandwich bags and insert them in a paper towel tube that has been cut in half (or thirds). 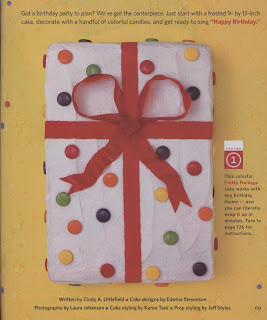 Then wrap tube in a piece of tissue paper and tie the ends with yarn or ribbon. Give the tubes to the children at snack time. In a bowl, blend 1/4 cup creamy peanut butter into 3/4 cup milk. Add 1/2 box of instant pudding mix, any flavor. Beat slowly with hand beater until well-blended (two minutes). Let stand five minutes. Spread the filling between graham crackers. Freeze until firm - about three hours. Cut a variety of cheeses in small squares. Poke a pretzel into each one. Children can connect their cubed cheese with the pretzel sticks to make cheese towers. Show them off before eating. My kids like to take this further and use the cheese cubes and pretzels like “tinker toys”. Peel and cut 1 banana into 4 equal pieces. Poke an ice cream stick into each chunk. Spread some peanut butter on each banana piece. Roll peanut butter-coated banana into cereal. Watch your favorite monkey eat up these treats. No one in our house drinks alcohol, so I really like to make this drink when we have Mexican food. The kids AND adults love it! Imagine my surprise to find out that historically, the Mojito is thought to have been brought to Cuba by pirates! Arrrr! A great drink AND a good story. I'm hooked. The mojito has a legendary history of its own; the buccaneering lore behind this particular drink is noteworthy. There's much debate as to when exactly the mojito was invented and by whom. Many claim it was crafted in Cuba in the late 1800s. Others elaborate on this theory saying that the mojito was the preferred beverage of Sir Francis Drake as early as the 1500s. According to The Mojito Company's website, it was English pirate Richard Drake who prepared the first version of the drink using aguardiente, an unrefined kind of rum that he mixed with some sugar, lime and mint. Story has it the swashbucklers introduced the drink to Cuba on their treasure-hunting exploits through the Caribbean and Latin America. So, grab your favorite little Swashbucklers, put on your eye patches, and make up a batch! 1. In a cocktail shaker (or whatever), muddle the mint, sugar, lime juice and Simple Syrup. Add ice, shake well and pour into a tall glass. Top with the ginger ale. 1. In a small saucepan, bring 1 cup of sugar and 1 cup of water to a boil; simmer until the sugar is dissolved, 3 minutes. Note: The syrup can be refrigerated for up to 3 weeks, so make a batch ahead of time and you've got quick and easy drinks!